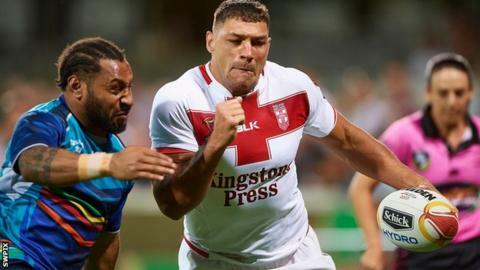 England thrashed Affiliated States 74-12 in their only warm-up game before the World Cup. Wayne Bennett's side scored 13 tries at Perth Oval against a side made up of players from Western Australia, South Australia, Victoria and Northern Territories. England face world champions Australia in the tournament opener in Melbourne on 27 October. "It was nice to see them enjoy themselves," said Bennett. "I'm really pleased with it. It was a chance to work on combinations and get a bit of contact without being silly. We didn't extend ourselves too much." Luke Gale, Ryan Hall, Jermaine McGillvary and Tom Burgess scored two tries, while Elliott Whitehead, George Williams, Kevin Brown, Kallum Watkins and James Roby also touched down. All but one of England's 24-man squad played at least 40 minutes in a game that was split into four 20-minute quarters. Jonny Lomax, who suffered a hamstring problem in the final game of the Super League season, was the only player not to feature. Bennett, who expects Lomax to be available against Australia, said: "We know how real it will be next week. It all starts then." England, World Cup semi-finalists in 2013, meet Lebanon on 4 November and France on 12 November in their other Group A games.